For thousands of years, the Chinese New Year celebration has marked the beginning of a fresh new start as the year begins. With the new beginning, the special day signifies the welcoming of year-round happiness, prosperity, good health, and a long life. The following tips for celebrating the Chinese New Year will attract good luck into your home and bring increased harmony and balance into your life. It is important to thoroughly clean your home, or office, several days before New Year's day arrives. This will cleanse your space of all ill fortune and negative energy that accumulated during the past year. Never do any housecleaning during the first day of the Chinese New Year celebration. It is believed any cleaning on that day will sweep away all the good luck that just arrived with the New Year. Generally, it is best to avoid any housecleaning for the first few days of the new year. Stand in the center of a room, your home, or workspace. Completely clear your mind of all thoughts. Use a singing bowl or ring a seven-metal bell until you feel your entire space is one or infused with the sound of the singing bowl, or the ringing of the bells. End the ceremony by lighting sandalwood incense in the space where you performed the ceremony and several other areas throughout your home. On Chinese New Year's Eve, enjoy a dinner with your family as a symbol of the closeness and intimacy you share. After dinner, herald in the New Year with your family. Keep a bowl filled with mandarin oranges on your table and offer them to every person that comes into your home during the New Year's celebration. Mandarin oranges are a symbol of prosperity, good fortune and longevity. On New Year's Day visit close relatives and have a meal together, enjoying foods that symbolize happiness and wealth. Give your teenagers and children ang-pows, which are small red packets filled with coins. During the following days of the New Year's celebration, visit friends and enjoy each other's company and your favorite foods. Greet members of your family, your friends and other guests by saying in a strong and friendly voice "Gong Xi Fa Chai!" which translated means, "Have a happy and prosperous new year!" On New Year's Day do not reprimand your children. It is a day of auspicious celebration and is meant to be enjoyed by everyone. Giving a gift of Chinese coins tied together with red ribbon or thread is very auspicious. Place all sharp cutting implements, such as scissors, knives and razor blades out of sight. 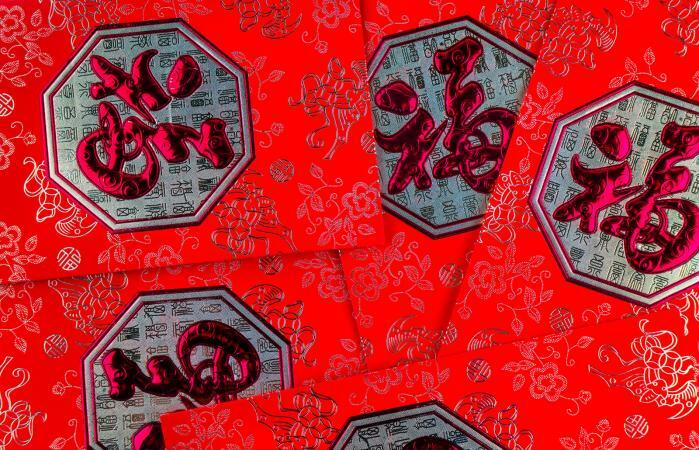 These items can quickly shred a person's luck into many pieces and are considered very unlucky for the Chinese New Year. Paying off all of your bills and debts is an auspicious and positive thing to do as it shows you are tying up past issues and problems. If you cannot pay off your bills and debts completely, make a payment to each one as a symbol of positive action. If you are single, on the last day of the New Year's celebration -called Chap Goh Mei- go to a river, lake, or ocean and throw in fruit as a way of attracting a good spouse. With each piece of fruit you throw into the water, make a wish and ask for the perfect love match. In China, women toss oranges into the water and men throw in apples. Following New Year's good luck tips adds to the fun festivities and joyous times of this auspicious Chinese holiday celebration. Even if you can't enact every tip here, carrying out a few is bound to improve your life and your outlook, and that's a way of making your own luck.